In February 2019, Canadian magazine B-School Times announced its first “100 Most Famous B-School Figures in China” list, to recognize their outstanding contribution to the B-school community and relevant areas in the past 40 years of China’s reform and opening up. Experts and scholars from more than 300 business schools in China were selected based on a total of 13 criteria covering academics, teaching and social influence. 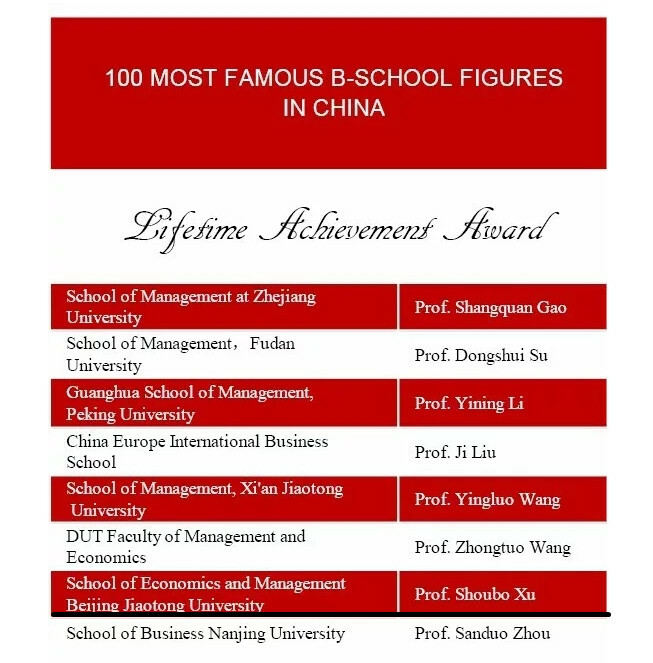 Prof. Shoubo XU selected "100 MOST FAMOUS B-SCHOOL FIGURES IN CHINA" Lifetime Achievement Award. The “100 Most Famous B-School Figures in China” is the first list of its kind published by a Canadian media outlet about b-school education in Mainland China. Data collection and evaluation took nearly an entire year. The pool of candidates included individuals from B-schools located in different parts of Mainland China, spanning 40 years since country’s reform and opening up. B-School Times conducted an in-depth review of the candidates across 13 dimensions. After careful review, the 100 figures who stood out were named the “100 Most Famous B-School Figures in China”. “Let a hundred flowers bloom and let a hundred schools of thought contend.” Through researching and reviewing the diverse pool of individuals and their contribution to the development of China’s business schools, we are pleased to discover that China’s B-schools have advanced by leaps and bounds. Today, they are showing strong growth momentum in their efforts to become not only the pipeline of business talents, but also positive contributors to society and internationally minded institutions.